An utterly captivating opening 60′ gave way to a late rout as le Oranje dominated the last third of the game, raising serious questions about the defending Cup holders, who suffered the worst loss by a defending champion in World Cup history. Spain used the same 4-2-3-1 they have used for the past five years (their supposed 4-6-0 merely expressed disapproval at using a player classified as a midfielder rather than a striker in the top spot). Diego Costa, though new to Spain–literally, given his that his junior football was played for his birth nation, Brazil–was expected to start up top. Chelsea’s César Azpilicueta edged out Juanfran at right back despite the latter’s reported return to full fitness. Following the Netherlands’ go-ahead goal, Spain shifted to a 4-3-3 with Andrés Iniesta moving inside and Pedro Rodríguez, replacing Xabi Alonso, moving to the flank. While that change probably can’t be blamed for the immediately following set piece goal, it’s pretty clear that the shift gave up more in defense than it gained in attacking verve. Louis Van Gaal stuck with the 3-4-1-2 the Netherlands used in their first two build-up friendlies rather than the 4-3-1-2 that he fielded against Wales. Though not a major surprise, it does run counter to the “spare man at the back” dictum which would require only two center-backs to deal with Diego Costa. Costa was indeed a handful for Holland’s back line, but Van Gaal’s decision was probably based on his desire for a high-pressing squad, a plan that probably wouldn’t have allowed more protection from Costa in any case. The press was meant to cut off delivery, and that necessarily meant that when the ball did get through, the chances would come against a recovering defense. The only significant switch came at around the 60′ mark, when Arjen Robben shifted from the left side to the right of Robin Van Persie, returning him to an inverted role more like the one he usually plays at Bayern Munich. So much changed at this point in the game (Spain’s formation change and the potential impact of aging and over-worked legs in the final third of a hot, rainy game) that it’s difficult to disentangle causation from correlation; but Robben looked markedly more dangerous after the switch, and it will be interesting to see where he lines up against Austrailia and Chile. Ron Vlaar (Ned) – There were much flashier performers for the Netherlands, and looking only at the stats you would probably decide that Stefan De Vrij was the day’s most impressive Dutch defender. But Ron Vlaar’s performance as the last man in Holland’s 3-man defense was absolutely critical in the very tight opening 60′ of the match. As Michael Cox noted in his analysis, the game’s central tactical feature was the high press and resulting high defensive lines of both sides. This meant that while Spain lacked time on the ball in midfield, there was plenty of space behind the Dutch defense when they could get through–and in the first half, they did. With both Martins Indi and De Vrij on the right often drawn into the midfield pressing Silva and Iniesta respectively, Vlaar was often left to clean up (especially for DeVrij on the right, as his defensive dashboard below demonstrates). His best moments bookended the game: his authoritative quashing of Diego Costa’s one-on-one effort at 13′, and his sliding tackle to deny Fernando Torres an admittedly pointless one-on-one chance with the goaltender after Silva stripped Robben just outside the Dutch box at 83′. But Vlaar’s defensive stats were perfect: 5 of 5 clearances (o), 3 of 3 tackles (x), 1 blocked shot (), and 2 interceptions (<>). Along with Cillessen fingertip deflection of David Silva’s 43′ chip effort, it was Vlaar who handled the risk inherent in the Dutch strategy, allowing others to reap the rewards. 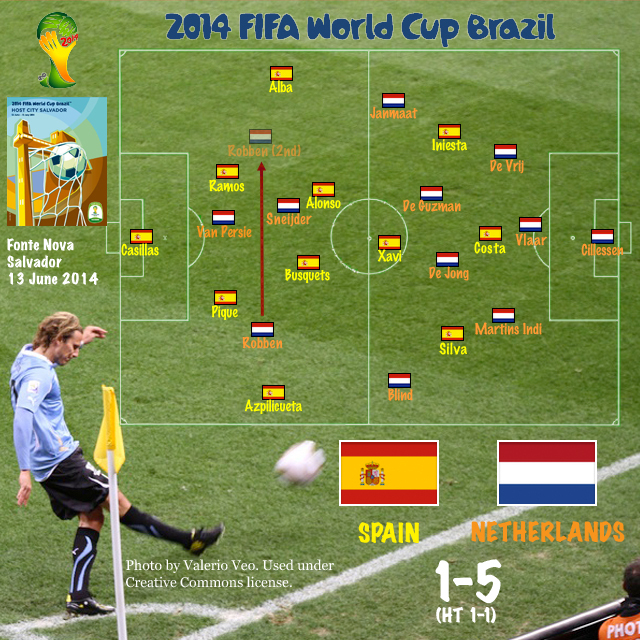 Daley Blind (Ned) – While Spain had no time in the midfield, neither did the Netherlands. Their goals instead came from very long balls over the top–and the two that mattered both came from Blind on the left. His width was important less for getting the ball quickly up the flank than for having enough space out on the wing to deliver killer balls. His assists for Van Persie and Robben were nearly identical, and they were the goals that changed the game. Wesley Sneijder had a similar long ball over the top to allow Arjen Robben’s second goal, but by that time the game was already over. Robin Van Persie, Arjen Robben (Ned) – Though less surprising than Blind’s contribution, both Van Persie and Robben demonstrated why they are in the 2nd tranche of elite strikers (or 3rd, if you consider Messi and Ronaldo as a class of their own). Van Persie created the first candidate for goal of the tournament, and Robben showed why no defender wants to be alone with him in their box. Xavi Hernández (Esp) – Having said that, Xavi looked much more commanding in this game than he did at Euro 2012. This may simply be a function of facing a high press rather than a parked bus, which reduces time but allows the space (limited though as it is) for Xavi’s genius to operate. On the other hand, Tata Martino’s increased rotation of players at Barcelona may mean that Xavi is entering this tournament ever so slightly more rested than usual. But Chile definitely won’t sit back, and if Austrailia play as they did on Friday, Xavi may have room to operate throughout the group stage. It’s worth noting that, three days in, positive football is the order of the day for this World Cup. Goals may be overrated (and I also believe that Spain’s negative reputation misunderstands the nature of true beauty in the game), but open play is the neutral’s joy. We can only hope the trend continues. Diego Costa (Esp) – Costa’s penalty is an interesting exercise in thinking about the nature of penalties in the game. Replays show that it was clearly manufactured, Costa stepping back onto De Vrij’s passing leg in order to go down. It looked funny at full speed as well, but to me at least, it looked to be one of those “legitimate” manufactured penalties, hang out a trailing leg to ensure contact. Moreover, De Vrij clearly put himself in the position to produce a penalty by going to ground, and while that doesn’t justify Costa’s actions, it did, as the saying goes, “give the referee a decision to make.” Earning a goal off a manufactured penalty is one of the best reasons, by the way, to consider implementing some version of video replay. It also seemed to me that the Netherlands also benefited from a make-up non-call at 43′, when Martins Indi shouldered Diego Costa over inside the box to keep him from receiving a cross from Iniesta. It’s best not to make a mistake in the first place, but recognizing the quiet correction of mistakes in the game is important to fairly judging a referee. For what it’s worth, I think that the official handled Costa’s little head nod and Martins Indi’s ridiculous play-acting in just the right manner. Even so, Costa is very lucky to have been seen by a referee who took that sensible view, thus leaving him in the game but also ineligible for after-the-fact sanctions (I am presuming here that the incident was in the referee’s report, which is why FIFA has not taken further action). It’s interesting that, after a very disciplined season as Dr. Costa at Atlético, Mr. Diego appears to be re-emerging for Spain. Costa will definitely be one to watch going forward.